Exciting NEW Developments for MTA Boys! Minnesota Thunder Academy proudly announces Steve Bellis as its new Boys’ Director, effective July 15, 2018. Between now and his official start date, Steve will be meeting with MTA’s coaches and staff to prepare for the 2018-19 soccer season, including tryouts. Steve already has a positive history with MTA, as he led Wings Soccer Club prior to its merger with MTA. Before his time with Wings Soccer Club, Steve spent time as an Olympic Development Program (ODP) staff coach. Before ODP and Wings, Steve spent four years as a boys’ soccer academy coach at Manchester United Football Club. After seven years as Head Coach at D-III St. Catherine University, Steve is, currently the Head Soccer Coach for D-II Concordia College. In his college head coaching roles, Steve has overseen all coaching, recruiting and budgets for the program. Steve is a native of Manchester, England. He earned a Bachelor of Arts (BA) in applied sport studies and social science from Lancaster University in Lancaster, U.K. Steve recently completed his Masters in Sports Management at Concordia College. Steve played for Chorley AFC in Lancashire, U.K from 1992 to 1998. Steve holds a UEFA and USSF ‘B’ Coaching License, an NSCAA Advanced National License, and an English Football Association Coaching License. Steve lives in Minneapolis with his daughters, Pippa and Ruby. Minnesota Thunder Academy is proud to announce that it has signed a partnership agreement with Villarreal CF. Villarreal CF is one of Spain’s biggest La Liga soccer clubs and is known internationally for world-class player development. There are players in every age group on the Spanish national football team who developed their skills at Villarreal CF. Additionally, MTA’s own, Mukwelle Akale, is currently making his mark with Villarreal CF. MTA is very excited to bring Villarreal CF’s professionalism, technical tools, and approach to Minnesota. 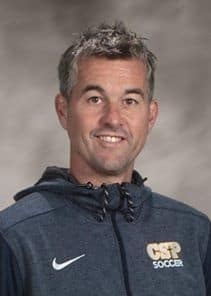 Tobbe is an established soccer coach and director with 13 years’ experience coaching youth soccer in Minnesota, high school coaching experience, and 6 years of collegiate coaching experience. Tobbe played for IF Brommapojkarna Youth Academy in Sweden before he helped Gustavus Adolphus College earn three MIAC Championships and NCAA berths. After College, he played semi-professional soccer for Swedish Club IFK Viksjo. Tobbe holds a USSF National D License, an NSCAA Director of Coaching Diploma, and is taking the USSF National C License certification this year.